What makes a hero? What do you want your legacy to be? Can one person really change their fate? After months of cross show promotion, world building, and numerous introductions, DC's Legends of Tomorrow premiered on The CW, a spinoff of Arrow and The Flash that centers around an assortment of heroes, allies, and villains. The hour was packed with action as well as exposition, but still managed to pose some big questions and set the tone for the rest of the season. The series begins with 'Pilot, Part 1' written by creators Greg Berlanti, Marc Guggenheim, Andrew Kreisberg, and showrunner Phil Klemmer. 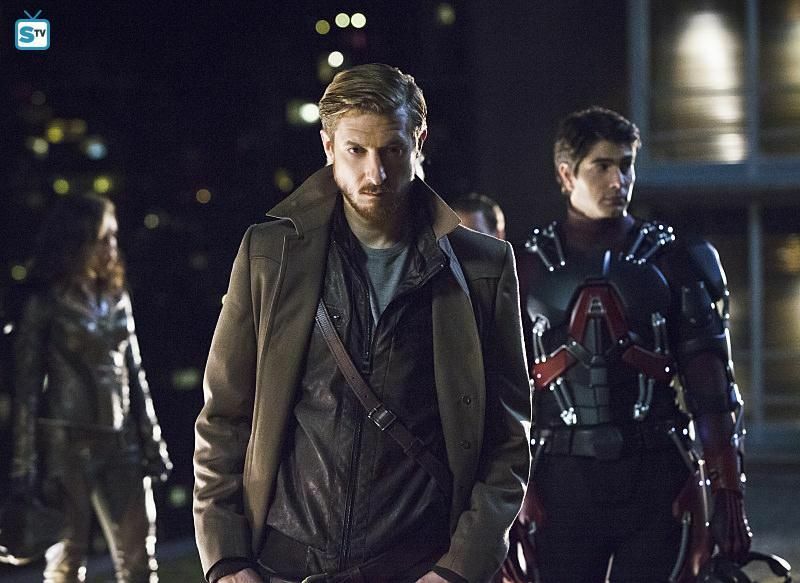 We are thrust into a dystopian future where a desperate Time Master, the dashingly named Rip Hunter (Arthur Darvill), begs the Time Masters Council for a time ship and the permission to change the timeline in order to stop the rise of immortal villain Vandal Savage (Casper Crump). He goes off in search of the eight members he needs to join his crusade, and that's right where things get interesting. Hunter collects his chosen band of misfits, a process that serves as a neat introduction for viewers who haven't been following along with Arrow and The Flash. He finds Ray Palmer/the Atom (Brandon Routh) in Star City learning to become a hero alongside the Green Arrow, and Sara Lance/the White Canary (Caity Lotz) running from her demons in Tibet. The new Firestorm, a.k.a. 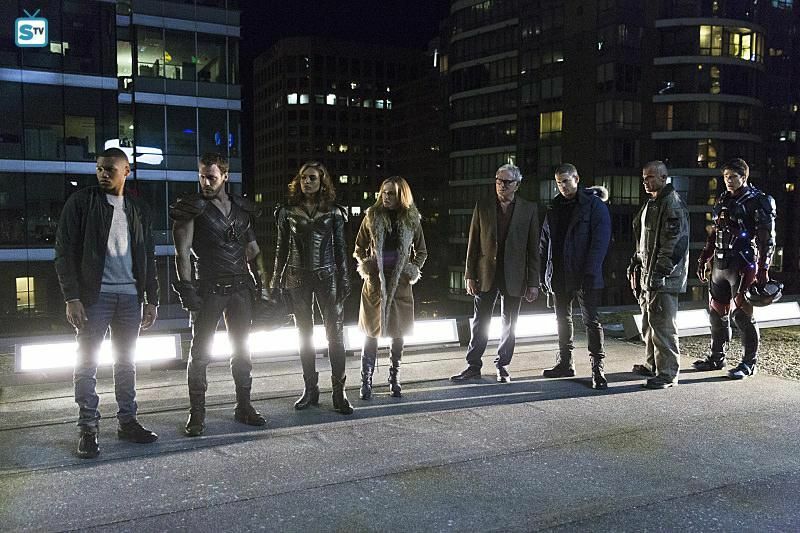 Professor Martin Stein (Victor Garber) and Jefferson “Jax” Jackson (Franz Drameh) are likewise training and developing their bond in Pittsburgh, while Captain Cold/Leonard Snart (Wentworth Miller) and Heat Wave/Mick Rory (Dominic Purcell) are found thieving in Central City. The winged demigods Hawkgirl/Kendra Saunders (Ciara Renée) and Hawkman/Carter Hall (Falk Hentschel) are in St. Roch, trying to fight crime and get used to one another. Once Hunter has everyone in one place he makes a very compelling argument for why they should join him on his quest across time. Appealing to their ego, he tells them that, as an authority on the future, he already knows they are destined for greatness. Appealing to their humanity, he shows them what havoc Savage wreaks on mankind. Quickly accepting that time travel is real and the world is depending on them they all sign up willingly. All that is, except for Jax who Martin literally drugs and kidnaps, making the doctor far less likable than he's ever been. The execution of building the team is fairly paint by numbers, but that's just fine here. We already know how this particular story ends - the show isn't called Average People Who Don't Do Much - and there is no real need for the team gathering to be unnecessarily complicated. What is important is the energy and style in which the pieces come together. Luckily, the show has both in spades, tearing through time and space with a confidence that some freshman shows - and most pilots - lack. They time travel to 1975, and Rip, Kendra, Carter and Ray head off in search of Dr. Aldus Boardman for clues on Savage's whereabouts. Kendra and Carter still feel like rival co-workers forced into a carpool, even as their continued backstory proclaims their true love. They find the doctor only to have him reveal that he is actually their son from a previous incarnation. The characters are still developing and we don't know them enough for this to have any real impact or shock value. His emotional revelation is glossed over quickly, and his eventual death feels as clinical and detached as they come. It's a weakness that undercuts the action, but at least moves the story along. While the others search for clues on Savage, Snart, Rory and Sara head out to a bar for some drinks and a good old fashioned brawl set to The Captain and Tennille. The scene perfectly encapsulates what is so captivating about the show: it's outrageous, improbable, and impossibly entertaining. All three actors have instant chemistry with one another; they're clearly having fun busting skulls, and we're having fun watching them do it. There are a few interesting concepts simmering under the surface throughout the episode. Snart and Rory's true reasoning for joining the team and the classification between the brains versus the thieves and killers in the group are among the most dynamic. Currently each person on the team has a natural partner, so it will be interesting to see those bonds tested and those pairing mixed up as they live and fight together. Of course not everything is what it seems, and Hunter's offer was - as Oliver hinted - too good to be true. An attack on the Wave Rider forced the truth into the open. He had stolen the ship after the Time Council rejected his appeal to stop Savage, and he is now hunted by them. His vendetta against Savage is personal, he killed his wife and son, and each were selected not because they're heroes, but because their lives have the smallest impact on the timeline. Or in the words of Ray Palmer they are simply a "collection of nobodies who time doesn't give a damn about." After absorbing that humbling bit of news they rally, deciding to try and change fate and mark their own heroic mark on the world. One of the biggest challenges for a project this ambitious will not be the sweeping time travel - The Flash has already paved the way for time-bending sci-fi twists - but in following nine lead characters and giving each of them depth and personality. Characters like Snart or Sara, who had the benefit of developing on The Flash/Arrow, are already far more three dimensional and real then the newcomers, especially Jax and Carter who haven't had much to do and have no real discernible personalities. That being said, this is a normal issue for a new show and this episode is only the first half of the pilot. Not airing the two part episode back to back seems like a programming misstep for The CW, and we hopefully see more character development in the second episode. In the end this pilot is the means to an end, introducing our leads and setting the stage for the action and adventure to follow. The seeds planted in this episode are promising, and the small flaws don't outweigh the shows many good qualities. The team has enthusiastically signed up for a quest, and watching that adventure unfold looks to be a whole lot of fun.